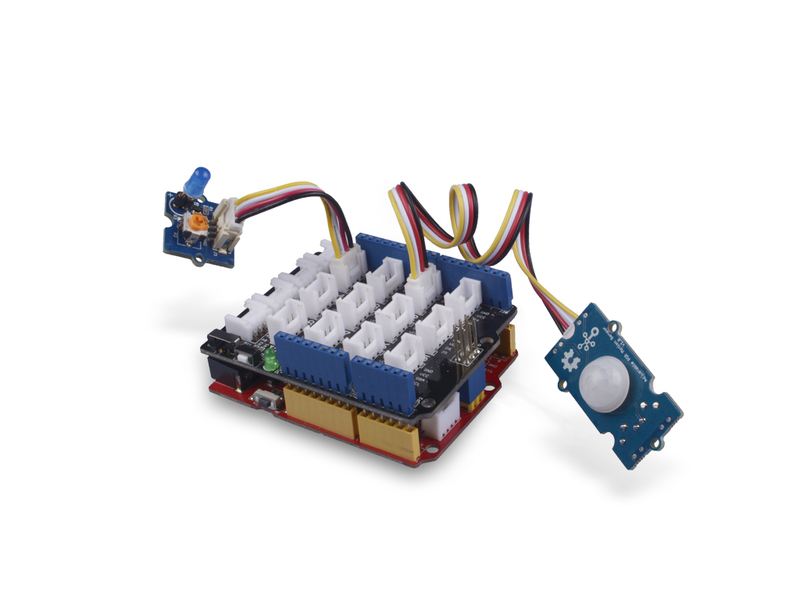 Grove - Adjustable PIR Motion Sensor is an easy to use Passive Infrared motion sensor, which can detect infrared object motion up to 3 meters. 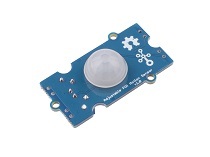 Any infrared object moves in its detecting range, the sensor outputs HIGH on its SIG pin. And you can adjust the SIG HIGH time up to 130s via the potentiometer, moreover, you can adjust the detect range via the other potentiometer. The Fresnel lens equipped with the module is a plastic piece and is prohibited from approaching high temperatures or open flames. The typical voltage of L221D is 3.3V, so we use the XC6206P332MR chip to provide a stable 3.3V. 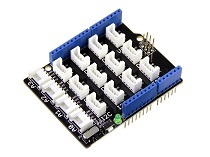 The input of XC6206P33 ranges from 1.8V to 6.0V, so you can use this module with your Arduino both in 3.3V and 5V. 2 Each Grove module comes with a Grove cable when you buy. In case you lose the Grove cable, you can click here to buy. Step 1. 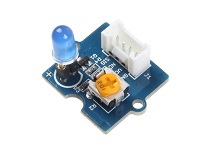 Connect the Grove - Adjustable PIR Motion Sensor to port D2 of Grove-Base Shield, connect the Grobe - Blue LED to the D4 port of the Grove-Base Shield. 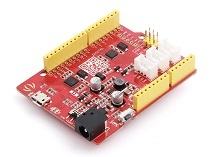 If we don't have Grove Base Shield, We also can directly connect this module to Seeeduino as below. Step 1. Just click the icon in upper right corner of the code block to copy the following code into a new sketch in the Arduino IDE. if(isPeopleDetected())//if it detects the moving people? if(sensorValue == HIGH)//if the sensor value is HIGH? Step 2. Upload the demo. If you do not know how to upload the code, please check How to upload code. If every thing goes well, When someone approaches this sensor or when you approach this sensor with your hand, the LED will light up.